Register now, it's 10’ away! You don't need to sign in to shop from VINHA. You may enter your delivery data upon checkout. Register now and get our newsletters. You must be of legal drinking age in your country to register. We’ll ask your data upon checkout. Nice and easy! Just check what you're looking for! You can choose more than one! The name Easter comes from the Hebrew word Pessach, that means passage. Easter is an important date for both Christian and Jewish religion. The celebration of this special occasion calls for socializing, food, sweets and, of course, wine! In Portugal, part of the celebration of Easter is made at the table with family and friends. Of all the sweets that enrich the tables in Portugal the folar is the most popular one. Made in a very simple way, water, salt, eggs and corn flower based, what makes it memorable is the different shapes and fillings that it takes on according to which country region that its made in. Here the folar is sweet, so much so that very often it is known as ‘pão-doce’ (sweet-bread). Besides the folar, ‘broinhas’ and ‘pão-de-ló’ are also very popular. In this region the folar is more complex, big or small, its filling of vial meat, porc, bunny, chicken, ham and slices of salami enrich the dough and palate of those who savor it. In Beiras the folar characterizes itself for its taste of cinnamon and sweet herbs, complemented by one or two boiled eggs or by a couple of colored eggs. Here the folar has more personality, the paschal sweet is made in the shape of a double heart or in the shape of animals (such as little chicks, pigeons, lambs or even lizards), decorated with boiled eggs and white almonds. In the south of Portugal, the folar is known as ‘folar de folhas’ or ‘Olhão’s folar’, the main ingredients are cinnamon and brown sugar. Aside from the folar, it cannot miss at the Portuguese tables the ‘pão-de-ló’ and the roasted goat or lamb. Wine is always an important link between different stages of the meal. Therefore, it is important to take into consideration the characteristics of the dish, in order to choose the wine that best suits it. Once the traditional roast is an aromatically strong dish we need to select a wine, equally strong, that is capable to make its flavor stand out. 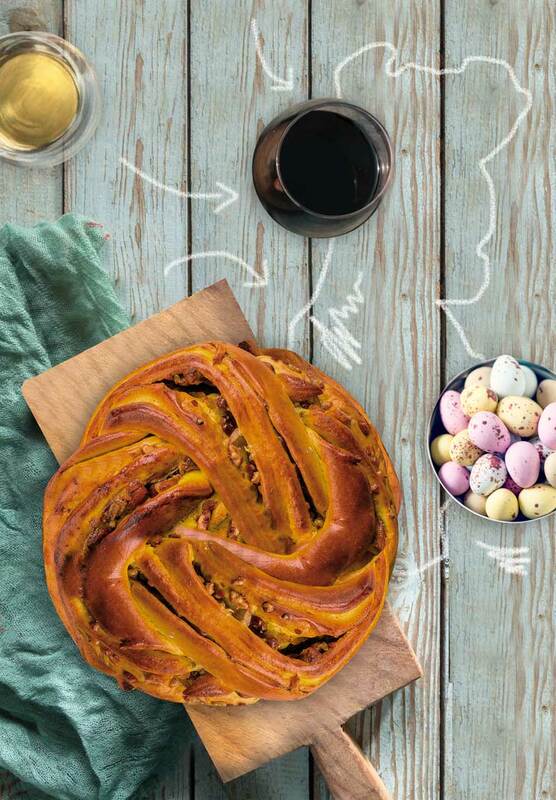 We share here some suggestions, to toast with your family this Easter. Work, fun and wine – Today is the day!